Two Nobel Peace Prize winners and two former Heads of State got this year’s RISING Global Peace Forum underway at Coventry Cathedral. More than 200 delegates from around the world are attending the two-day symposium, being held for the third time, with the list of leading figures in the sector making it the most high profile yet. 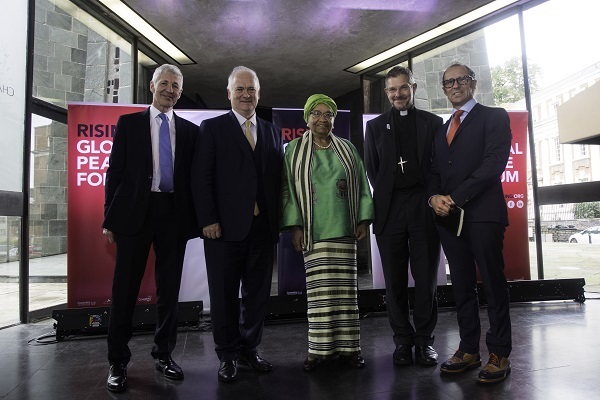 RISING was launched in 2015 as a partnership between Coventry University, represented by the Centre for Trust, Peace and Social Relations, Coventry Cathedral and Coventry City Council – with founding inspiration and sponsorship from Archbishop Desmond Tutu. The annual gathering brings international peacebuilders, policymakers and academics from around the world to Coventry, the UK’s only City of Peace and Reconciliation, for a first day of sharing insights and exploring new ways of resolving conflict and of building sustainable peace, and a second day for reflection and conclusions. RISING 2018, themed on the ‘Anatomy of Peace’, is focusing on the complex process of initiating contact, making a deal and sustaining peace. Former Irish Prime Minister John Bruton, who was heavily involved in the Northern Ireland peace process leading to the Good Friday Agreement, was among today’s keynote speakers. Nobel Peace Prize winners Ellen Johnson Sirleaf, a former President of Liberia and first female African head of state, and Tawakkol Karman, a highly-prominent human rights activist from Yemen, also addressed the opening day. Professor Mike Hardy, chair of RISING and executive director of the Centre for Trust, Peace and Social Relations at Coventry University, said: “RISING set out to become a ‘Davos’ for peace and this year’s event really has raised the bar in terms of the significance of our speakers. Alastair Campbell, former Downing Street Director of Communications and Strategy, will be the speaker at a gala dinner this evening. A ground-breaking film on human trafficking, ‘Trafficked’, will also be screened at Coventry University’s Square One Cinema. The RISING 2018 forum closes tomorrow with a series of speaker-led workshops including Francie McGuigan, one of Northern Ireland’s so-called ‘hooded men’, leading a debate on managing unresolved issues after a peace agreement. heavily involved in the Northern Ireland peace process leading to the Good Friday Agreement, was among today’s keynote speakers. The Peace Run, the world’s longest relay run which promotes global peace, will be welcomed by RISING when it visits Coventry tomorrow as part of a seven-month journey with a symbolic flaming torch across Europe.